In the Mexican state of Sonora, elementary school children got down on the floor to avoid a lost bullet amidst a fight between drug cartels a few feet outside the campus. Teacher Rocio Romero acquired “heroine” status for taking care of her young students during the scary moment. From the moment Romero heard the first gunshot, she knew how to react to make sure that her students felt safe. Teacher Romero asked her students to stay on the floor while the Sinaloa Cartel and the Jalisco New Generation Cartel shot each other. 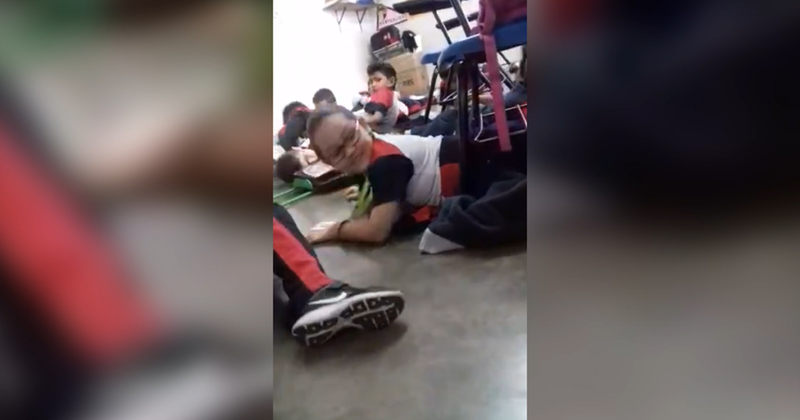 During the Spanish class, the 35 second-graders threw themselves to the floor believing it was only a drill. Romero told them nothing was happening and asked them to sing a song. “I don’t even understand the song,” Romero said in a relaxed manner. One of the kids asked if it indeed was a drill, to what Romero said yes, and that they had to do everything accurately and sing. Two men died in the gunfight, and three got arrested. Officials transferred the two deceased to the Medical Forensic Service. The responsible subjects for the shooting got identified as 33-year-old Jorge Eduardo, 45-year-old Brígido Leonel, and an unidentified 17-year-old boy. A similar event occurred back in 2011 in the city of Monterrey, Nuevo Leon. A kindergarten teacher Martha Rivera asked her kids to stay on the floor when she heard a gunshot. The kids chanted, “Si Las Gotas De Lluvia Fueran de Caramelo,” While four men shot each other outside with AR-15 and AK-47 rifles.